I foresee Checo having a fantastic season, with some top 10 finishes and more spanking qually laps. Looking forward to it! Eyes on You Checo! As a Texan, I will be proudly cheering on Sergio when he makes his way around our Circuit of The Americas track this November. I'll see you in 255 days, when P1 starts. I'll definitely be following Sergio through his time in F1. His driving in Australia won me over - sliding a very twitchy car around. Was mightily impressive just to watch. Simple flair. Checo had a fantastic race! He is doing exactly what we knew he'd do !!! GO CHECO GO!! Sergio Perez, the first Mexican F1-driver ever since 30 years, is sitting with self-confidence in Sauber's premises on Singapore Grand Prix -paddock. The 21-year old youngster already handles interviews with routine. – I always liked to watch Kimi Räikkönen's performances. He was just so fast, Perez says and looks the reporter in the eyes as if to add more weight into his words. At the moment many things combine Perez and Räikkönen. He has started his F1-career in Sauber just like Räikkönen did 10 years ago. He has the same racing number 17 as Kimi had during his debut season. He came in 7th in his first GP-race in Australia - just like Räikkönen did back in the times. Whereas nowadays the 10 best get WC-points, only the 6 first ones got points during Räikkönen's season. Hence this will make a difference in the statistics. Räikkönen was 6th in the end results when Olivier Panis got a 25 second time penalty and was dropped behind Kimi. Perez - just like his team mate who came 8th, Kamui Kobayashi – was disqualified when the Sauber-car's rear wing didn't measure up to the demands. Last week Perez tested Räikkönen's old Ferrari from 2 years ago in Fiorano. – But on GP2-tyres, he reminds. Perez hopes that the similarities with Räikkönen won't stop with this debut year. – My dream is to win the WDC. Hopefully my development curve will from now on be the same as Kimi's was, Perez says. The best drivers in F1 from Mexico come from a time long before Perez was born. Brothers Ricardo and Pedro Rodriquez did a spectacular pioneering work in the 60's and 70's. Both drove for Ferrari. Pedro is the only Mexican GP-winner with two bull's eyes - first with Cooper in South-Africa in 1967 and then with BRM in Belgium 1971. Pedro Rodriquez is known in Finland also as Leo Kinnunen's team mate, when the duo took the world championship of prototypes in 1970. – Of course I know the history from the Rodriquez-brothers' times. I feel great pride when looking at what they achieved. It is still totally a mega-thing, Perez confesses to TS. Then what made Perez a F1-driver - surely not Mexico's traditions in this sport? – My family has always been involved in motorsport. I started karting at a very young age and then we made a big decision about me moving to Europe. I changed continent thinking that some day I will be a F1-driver. I was only 15-years old when I moved to Germany and started driving in Formula BMW-serie. Today Perez is almost a mega-star in his home country. When he drove a brilliant race on his first GP-weekend, the F1-publicity in Mexican media was guaranteed. – The Mexican reporters don't come to every race but the media follows the races very closely. I get good support from them all the time. Australia was quite a sensation and I got a big hype from that. Then again my injury in Monaco was the other extreme and it created big headlines. Apparently success and accidents bring the biggest headlines. 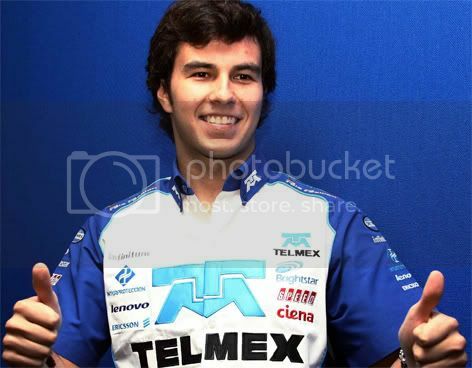 Perez has extremely strong backgrounds in Mexico, especially since Carlos Slim and his companies are titled as the richest in the world and they sponsor Sauber, but the driver also has a warm relationship with Mexico's president Felipe Calderoni. Perez has flew with the president's private airplane. When he was injured in Monaco and went to his home country to heal, Calderoni invited him to the castle asking how he is doing, without any middle-men. – I often talk with the president. We have quite close relations. I think it has to do with these F1-schemes. He likes me. I met him when driving in GP2 and after that I have always got support from him, Perez smiles. Perez is satisfied with his first F1-season. He wasn't even surprised over his strong performance in the debut race. – My goal was to score points immediately. I knew that the car was competitive. However I was very unfortunate in the qualification. I lost the morning free practice and didn't get to test the car with little fuel at all. Then there was traffic in Q2. It's not easy to go from this to a race, but I took a risk with optional tyres and everything worked well to the finish line. – I could feel joy over the points for a few hours until they were taken away. – Then it went backwards after the accident in Monaco. I lost two races and it took another two races to get back to the real rhythm. Ever since Hungary it has started to go better again, although I didn't get any points in Monza because of an unfortunate gear problem. You tested a Ferrari. Is your dream also to drive in Ferrari? – My dream is to win the WDC. If Ferrari can give me that opportunity, then of course I will grab it. That test in Fiorano was part of my contract with Ferrari's driver academy. I was supposed to test already after Monaco, but since I got injured it didn't happen, Perez says. Next year Perez continues in Sauber with Kamui Kobayashi. – Our relationship works well, but Kamui is a difficult team mate because he is so fast. He does his job well and sometimes it's a really tough challenge to beat him, Perez says. 2009-2010 in GP2 – came in 2nd in 2010 after Pastor Maldonado. After his absolutely stunning performance in Malaysia I will be defo keeping an eye on him now. I was amazed with my jaw to the floor watching the fastest lap go to Perez each and every time he crossed the line, catching Alonso. My heart was beating like a jackhammer. I do believe he will achieve big things in his F1 career. good for you amigo !!! Ive been tracking him in the wings and he seems to have something. He continues to drive as expected in the Sauber - Making Q3 a good amount of the time and finishing high among the mid grid. Let's see what they can bring after the testing. Sauber has been surprisingly on the money in the first four races, more or less. And 3rd place today, fantastic! Hate to say it as I support Checo's teammate, but that was amazing driving. How he did it I'll never know. I like Sergio but I think these tires have made him a star. For whatever reason he is the best in the field at making these things last and it has worked like a charm for him. I do rate his talent though. He's clearly a special driver and I hope he is able to move up the grid next season. KK's also one of the good drivers out there. This season tires are very important and i feel SP is smoother with the tires, that's why KK isn't getting as good results. Because KK in qualy is every bit as fast as Sergio. But being fast AND smooth with the tires at the same time also takes a lot of talent. Technically KK has been more consistent in terms of the number of points scoring finishes. Top ten in points sure looks good on your resume. Keep it up, I'll be cheering for you when you make your way around the CoTA's come this November. The thing about Perez is that you never really see him turn in an insane qualifying lap or have a storming drive through the field where he pulls off some special overtakes. When he turns in an impressive performance, it is almost always down to using a 1 stop strategy and making the tires last. He has these races where he's nowhere and then all of a sudden at the end, he finds himself near the front while others are struggling with the tires. I just think his success is highly connected with these tires and I'm not sure how great he would be with different ones. Those who did not follow Sergio from his GP2 years need to take a look at those videos. He won Montecarlo, had an epic battle with Maldonado for the GP2 championship, and he was always very fast. He represents the next wave of great driver's, Pic, KK, Petrov, in summary he is in, Fernando, Button, Webber, Massa moving the wrong way. Another good drive by Sergio at the European GP. I guess his tires gave out on him at the end and couldn't hold of the newer tires following him. Looking forward to seeing and cheering for him when he comes to my hometown of Austin this November. OK, from 15 to 9th, and it could had been 5th if not for the strategy changes the SC imposed. Very good Sergio !!!! Great comeback from 17th to 6th! With better grid position, a win is around the corner! Yes, great drive Sergio, way to keep yourself in it. Looking forward to cheering for you here in Austin in November. Checo certainly seems to be the real deal and he proves it weekend after weekend. I disagree with Ferrari, he's ready now! Out of interest, has it been revealed how much Perez is being paid by McLaren for his (I think) 3 year deal? I'm just curious, as I think you could probably have got him at a bargain price just now. Yes, Ferrari missed a trick by not signing him. I really hope he does well to prove them wrong. For sure the car is not the last year´s McLaren, but let´s start by beatting Button. I honestly thought Checo had a very good race considering that McLaren screwed him over in quali and switched him to the 3 stop in the race. Seems like McLaren were really quite surprised at how Sutil was pulling away from Checo and reacted too quickly. Maybe, on a 2 stop, he could've been in front of Button and defended until the end. Ultimately, the McLaren race pace doesn't seem to be too bad fundamentally, but Force India are a lot better on the tyres. "I have no car to fight for victory," he is quoted by Brazil’s O Estado de S.Paulo newspaper in Hungary. "And in these circumstances, my only goal is to try to be better than my teammate, who is a world champion, a very capable driver," said Perez. Indeed, the controversial young driver from Guadalajara did not deny that when he sees Button ahead of him on a circuit, he becomes determined to attack. "If I overtake him, it means that I’m doing a good job," said Perez. "Jenson is the benchmark for judging my work," he added.